A cooking pot just for paste? Is that possible? The designers created this pot with a simple design and a innovating shape: using an old cooking method, where the pasta absorbs the starch, instead of letting them go with the water. The same happens with the sauce. New flavours, pasta al dente, straight from the pot. Everything was thought to the smallest detail: the pot comes with a lid, with a hole to let the water go. It also comes with a serving spoon and a base to place on the table. The spoon fits on the pots' handle, always at hand. 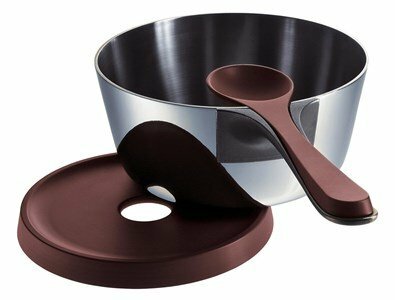 The pan is made of stainless steel with a melamine handle, base and spoon.